Design organizations, particularly ones that grow beyond 100 or so (and definitely beyond 150), find themselves in unchartered territory. 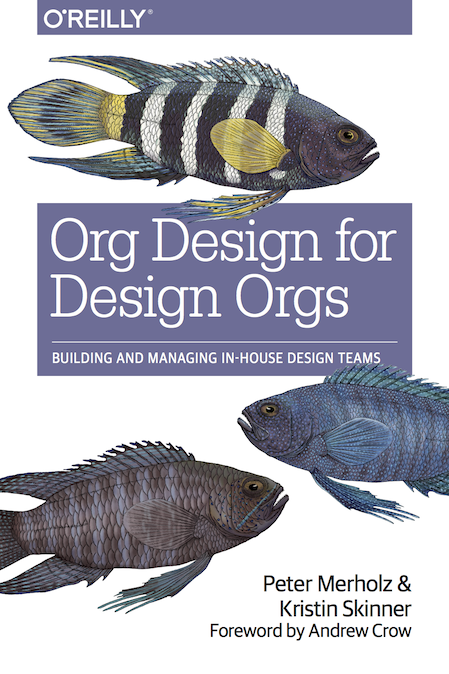 To support a team at that scale requires establishing a set of roles and practices that are distinct from the practice of design, and serve to enable the health and effectiveness of the design organization. Looking around, I see new roles and sub-teams, such as Design Operations, Design Education, Design Program Management, and People Development. “Design Operations” is emerging as the oversight to address all of this, but I think that’s a mistake, as the word “operations” suggests something more strictly mechanical than what we’re talking about. What I see is an opportunity for a new sub-org within design teams, Design Management, lead by a new role of Head of Design Management. (Let it be known that Kristin has been arguing for the role/org of “Design Management” for years now, and until recently I’ve fought her on this. I’m evolving.) This role serves as a near-peer to the Head of Design (near because they still report to them), and it addresses all the managerial and operational challenges that a design organization faces at scale, while the Head of Design, and their other reports (Design Directors, etc.) are focused on design leadership and delivering high quality work. It begins with People, under which there are the three Rs or Recruiting, Retention, and Reputation (I’ve taken this directly from Kristin). This is what tracks most closely with traditional HR and people management concerns – recruiting and hiring, job descriptions, performance reviews and promotions, developing a “talent brand.” The ultimate objective is Make Designers Happier, which is shown through such measures as speed of hiring (from posting a job to that person’s first day), internal referral rates, internal surveys of employee satisfaction, and retention rates. Then you have Practice, where the work is to build the skills and capabilities of the design team. In support of an objective of Make Designers Better are a suite of activities dedicated to the content of the work—professional development and skills-building, developing content, training and education, codifying process and methodology, and hosting internal events. I’m stuck on how to measure improvement here. Much of the impact of this will be shown in the employee happiness and retention numbers. Finally there’s Program, which is also what many think of when talking about “design operations,” and the idea here is to Make Designers More Effective. Program management helps design with planning and prioritization activities (including forecasting headcount needs), measuring effectiveness, standardizing tools and services that the design team uses, wrangling facilities to ensure the best working environments, evolving corporate policies that may obstruct the best design practice (particularly around user research), and owning the contractual relationships with external staffing, whether agencies or individual contractors. For measurement, I’ve used internal surveys for cross-functional teams to assess their satisfaction working with the Design team, but I think there should be more. An effective organization is one where the Design team is really humming along, feeling productive, seeing their work in the world. “Amount of work shipped” may be an indicator, though I’m wary of quantity measures. Originally I had “Culture” as a component of Design Management, thinking primarily on how culture is articulated, codified, and transmitted throughout the design organization. Upon further reflection, I’ve set it apart as a joint responsibility with design leadership. It’s not until a design organization gets to be about 100 that you need to consider a distinct Design Management sub-org. Up until then, the People and Practice activities are the responsibility of practicing design leadership, and there should be a team of Design Program Managers paired with these design leaders (typically at Director-level, maybe at Manager) who handle all the stuff under Program. Once you get north of 100, and definitely beyond 150, economies of scale set in where it makes sense to have people dedicated to People and Practice, particularly if the design team is continuing on an aggressive growth trajectory. For the former, you may have a Head of People Development (such as Laura Kirkwood’s role on Capital One’s very large design team), and for the latter, a head of Design Education (my pal Billie Mandel is in this role at Atlassian). And as these teams continue to scale, these heads, in turn, may need their own small teams to keep things going. Where is the Design System? Conversations about design operations inevitably turn to design systems, which are not explicitly called out here. I consider a company’s design system a “tool and service”, and thus partly a responsibility of the Program team. From what I’ve seen and heard, the most successful design systems (particularly in large companies) are built and run by fully staffed cross-functional product teams, such as the one that maintains Polaris at Shopify. I’m keen on hearing about other models for addressing the organizational, managerial, and operational concerns of a design team. Please let us know in the comments! Great post and next step thinking on top of a very influential book! Your articulation of three focus areas: People, Practice, and Program, alongside Design Systems makes good sense to me. I see the need for dedicated leads in all of those given my experience at Fidelity (where our design headcount has ranged from 150 to 330). For most of that time the general Design Leaders have been tasked with doing People and Practice work alongside the core mission of delivering high-quality work. We’re now at a scale inflection point where the folly of that model is clear. For many of my friends at start-ups and smaller design shops, business as usual continues by having a Head of Design who must juggle all of this at once. Designers are intuitively putting ‘Human-Centered thinking and values’ back in the center of Human Resources at every chance they get. But we’re also going to arrive at tougher questions when structuring talent / comp models. I’m looking forward to seeing increasingly progressive orgs where high profit margins allow the entire org to shift and absorb a designer mindset.